The daylight was fading fast, with a raging hunger, this simple idea, untried and uncertain was forming in my head. I had no idea if it was even going to taste good or not. I put it all on a plate, and crossed my fingers. Cauliflower is so endlessly versatile, and to think up until a few years ago, I’d only eaten it raw or boiled. Boiled? Ugh. Steamed is a much better, albeit bland, option, but if you allow it to go too far in the steamer, it’s lack of inspiration becomes legendary. 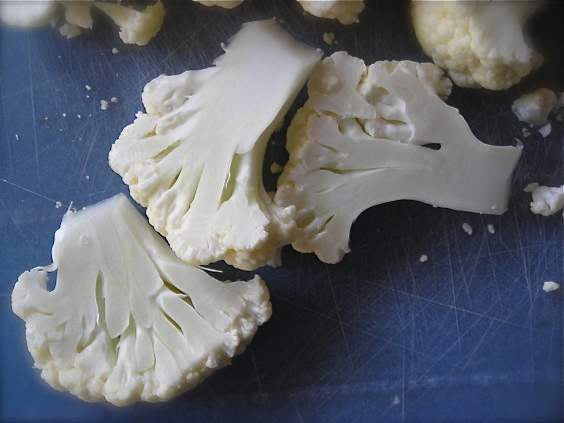 The epiphany, thankfully, was the pan of deeply roasted cauliflower that changed my mind about the stark white florets forever. I’ve tried it mashed like potatoes, and also pureed smooth with parmesan for a creamless alfredo sauce. But time and again, I placed a pan loaded with it in to a hot oven and devoured the results. That was about it for that vegetable, and I was fine with it. I could eat cauliflower year-round, and I do, but now with a few new methods in my arsenal, I can enjoy this vegetable a whole lot more. 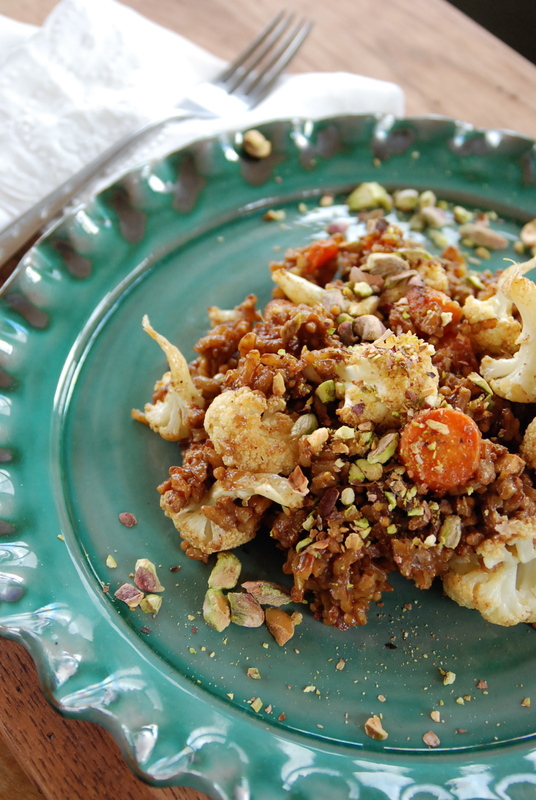 I came across this fried ‘rice’ recipe for Cauliflower on Shanna’s blog and knew that I had to get that going in my own kitchen. While I do love fried rice to the depths of my heart, it’s best when you have cold, cooked rice on hand and that’s not just something that materializes in this kitchen every day. But a head of cauliflower, ground in a few pulses in your food processor and mixed with the same type of seasonings in a hot wok can be a dynamite substitute, with a lot less calories and carbs. And simple doesn’t even do this justice. It’s ridiculous how easy and quick this is. I spent more time prying the leaves from the core of cauliflower than any other aspect of putting this together, including chopping an onion. Given that you’re basically pulverizing the vegetable, you can use the core of it as well and no one would ever know the difference. In less than 10 minutes after heating up my wok, we sat down to steaming bowls of this fragrant meal. 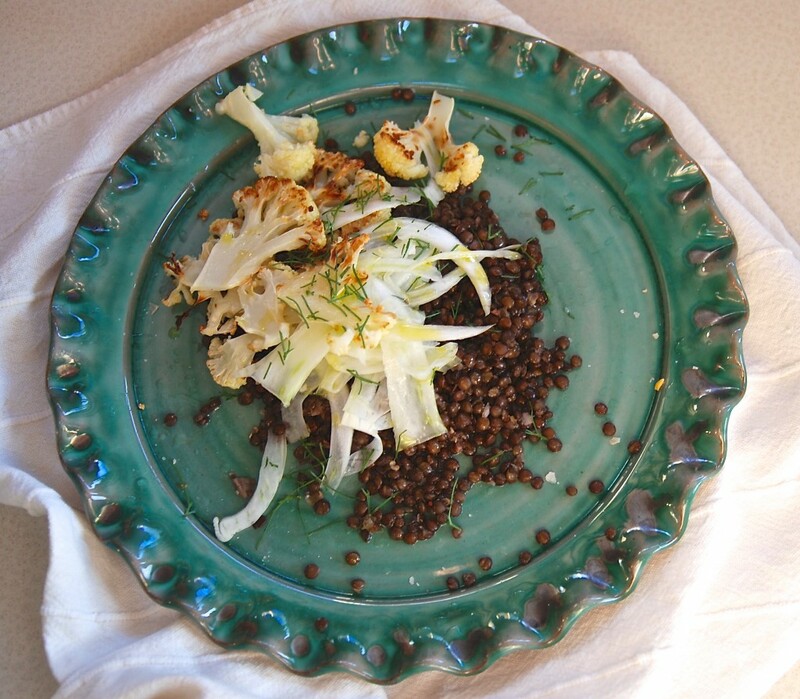 Shanna has two options for this recipe on her blog, which is a wealth of beautiful writing (with a love story that’s almost as good as ours…..) and this base of ground cauliflower could really withstand just about any treatment to create your own version. I made a rich curry flavored dish, enhanced with ground pistachios for flavor and as I tossed and cooked it, inhaling the fragrance from the wok, I started thinking of all sorts of vegetables I could add to this to make it better and deeper in flavor, and in a second round of this simple meal, I added in some leftover vegetables from a coconut curry stir fry that Griffin had made, as well as a few handfuls of cold rice and the results were equally spectacular. This will be a new favorite in our house, you can bet on that. Another mind-blowing option for Cauliflower that I’d been thinking about lately is to prepare it on the grill. I’ve seen methods of doing this by slicing through the head, creating a ‘steak’ and laying that on the grill. In my attempt to cut my Cauliflower though, my ‘steaks’ broke apart, leaving me with no other choice but to toss them on my grill plate to cook. Probably one of my best purchases for outdoor cooking, my cast iron grill plate lays directly on top of the grate and is perfect for cooking all manner of small foods; I can grill peppers and onions for fajitas, asparagus without losing any stalks, mushrooms, small fruit and a wide range of other foods, and it was perfect to create this smoky, sensational grilled cauliflower. I could barely contain myself from eating the entire bowl of it. My most favorite marinade to use on grilled vegetables is a spicy mustard vinaigrette, brushed or tossed with the vegetable prior to being placed on the grate. It imparts terrific flavor, with just a bit of punch from the mustard. I’ve found that it works well on almost every vegetable I’ve ever grilled. Which, admittedly, has been A LOT. I love to grill just about anything. 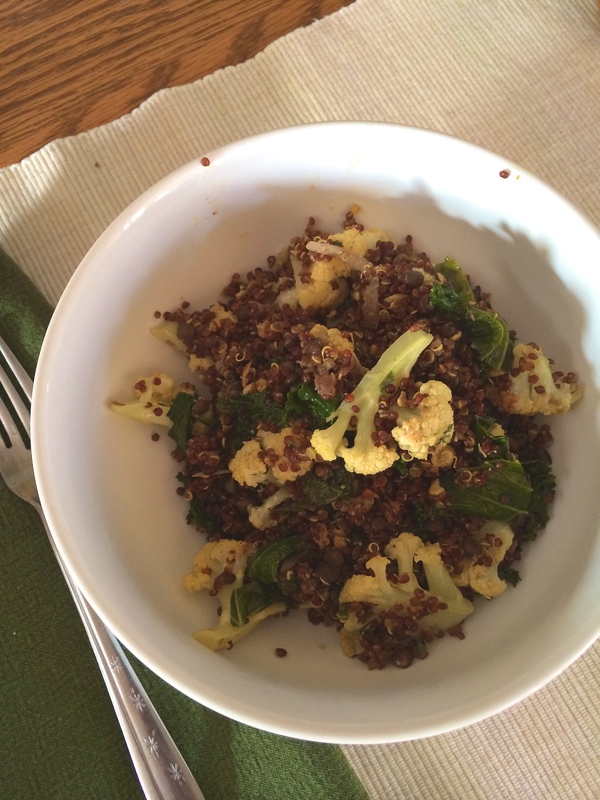 Place the cauliflower in the work bowl of your food processor and pulse to break it down. You want small pieces but not too deeply ground up. It happens fast too, and I need about 3-4 good pulses before it’s perfect. Heat a small amount of coconut oil in your wok, or other large deep skillet. Add the onion and cook, stirring continually, until it’s softened, maybe 5 minutes tops. Add the garlic and ginger and cook, stirring, for several more minutes. Add the cauliflower and stir to mix everything up. At this point, once the cauliflower is warmed, you can be done. I cooked it through a bit so it wasn’t completely crunchy, retaining just enough bite to be toothsome. It’s entirely up to you. 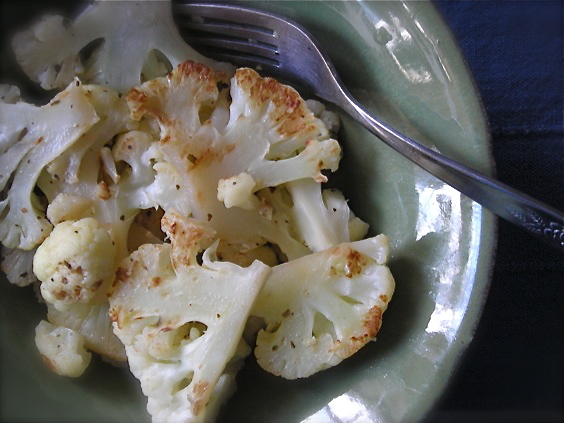 Drizzle the cauliflower with a bit of soy sauce and sesame oil, if desired, before serving. RECIPE NOTES: This can be treated like any fried rice recipe, using vegetables to bulk up the finished product. The variations you can make are positively endless. When I was 15 or 16, my Mom broke her left elbow roller skating. Outside of the fact that my MOM -gasp!- was roller skating (and apparently getting rather cocky about it) she happened to be left-handed, and in breaking her elbow, this rendered her incapable of doing much of anything. She lamented one day, as I helped her in the kitchen, “I wish I had learned to use my right arm more.” and somehow this struck a chord with me, as did her inability to manage even the most mundane of daily tasks. It’s been in the back of my mind since then to train my hands to work equally. Although my left handed writing looks like an overly caffeinated six year old, and my knife skills in my left hand are nothing compared to my right, I can whisk, scoop, stir, twist, grind, mix and pour from either right or left. I can reach and function and do just about anything needed during the course of my day without having to switch gears, hands or mindset. There is always more that your body can do, when allowed. If you’ve learned how to type on a standard keyboard, then you can teach your non-dominant hand to do any number of things. Even though one side of our brain dominates, and we develop a set of skills with that dominant hand, there is far more that one is capable of if you’re willing to put your mind to it. That goes for recipe usage too. Recipes are not cut in stone; they should serve as a guideline, a base from which we can expand exponentially in many different directions. I love recipes because someone else has already done most of the work for me, but I am free to remove this and substitute that, increase this or decrease that or look at how it comes out in one form and think “I know this can be better.” and then trust that my skills can take me there. These skills have been especially useful in the re-development of this incredible Red Rice Pulao. The origin of this recipe comes from Robin Asbell‘s New Whole Grains Cookbook, which, in a soft yet grand way simply changed my life in 2008. 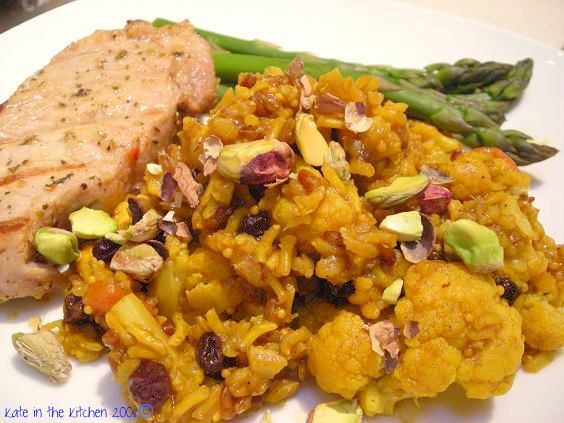 Long before the intense embrace by food lovers of all things whole grain, I’d run through a bookful of recipes using quinoa, millet, bulgur and various rices, finding great things to love about these simple staples. Grains are one of the easiest foods to work with in any kitchen, and require no special treatment. 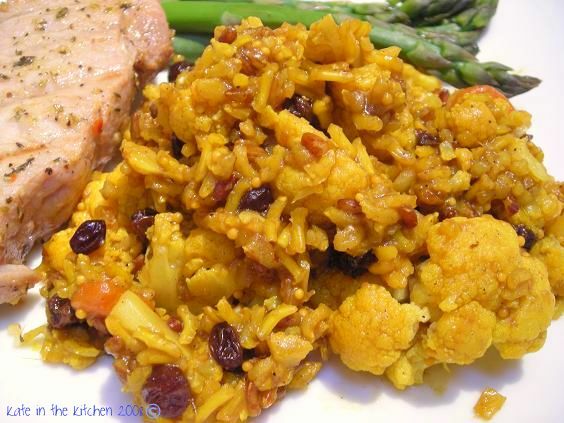 Particularly fond of the vibrant rices available, this Red Rice Pulao made for an chewy and delicious experience, and like many wonderful recipes on this blog, I simply posted it once and never went back. What a mistake. Because that means no one’s ever going to see it, as really, does anyone look in to the archives of a food blog? Rarely. And I loved the recipe when followed to a ‘T’. As I thought about it again, with more capability to be flexible in my cooking, I decided a second go of this dish was in order and am I ever glad I stepped up and made a few changes because this 2.0 version is light years better than the original. No offense to Robin, but the very task of cooking is to learn to feed oneself in the manner that makes you happiest. No cookbook author outside of us knows what makes us happy; only we do, and we owe it to ourselves to learn just enough kitchen skills to take the humblest of foods, such as rice and vegetables, and make them extraordinary. Let the recipe author be your guide, but let your imagination, your tastes and your skills drive you to cook with instinct instead of blind faith. Task-wise, this has a few moments of chopping and prep, but largely you are passing a great deal of idle time as rice simmers, and vegetables roast, while heady fragrances take over your home. This isn’t high-tech stuff here; with the heat of an oven and the magic alchemy of boiling water with rice, you can make an exceptional dish that tastes far more grand than it’s humble beginnings. 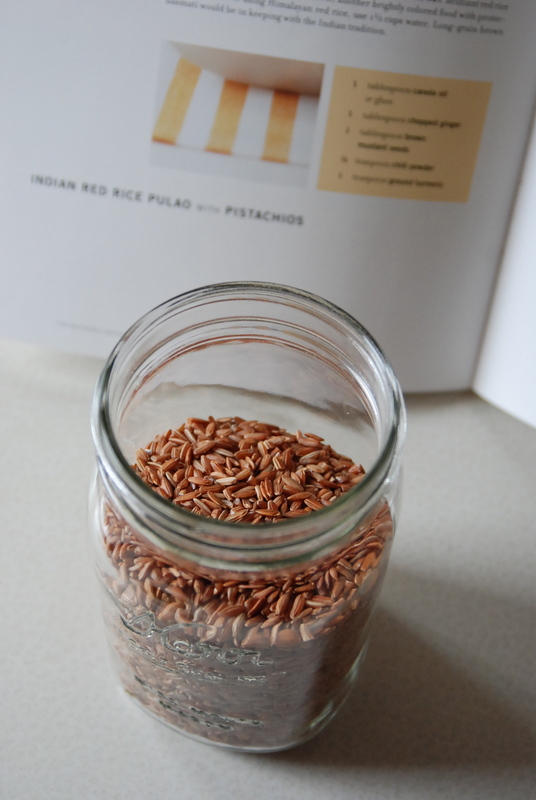 If you’re unfamiliar with red rice, it’s an intensely chewy rice, often found labeled as Himalayan Red Rice, or Wehani. Properly cooked, it takes up to an hour, all hands off. Finished, it’s a really hearty and satisfying grain, deeper in flavor than brown rice, not as earthy as wild rice. This dish is easily a main course, or can be eaten as a side with any number of proteins. I can vouch that it’s especially good with grilled pork tenderloin. Here’s where you get to decide what you do with this recipe, because if you want, outside of making the rice you can experiment wildly, with everything else. 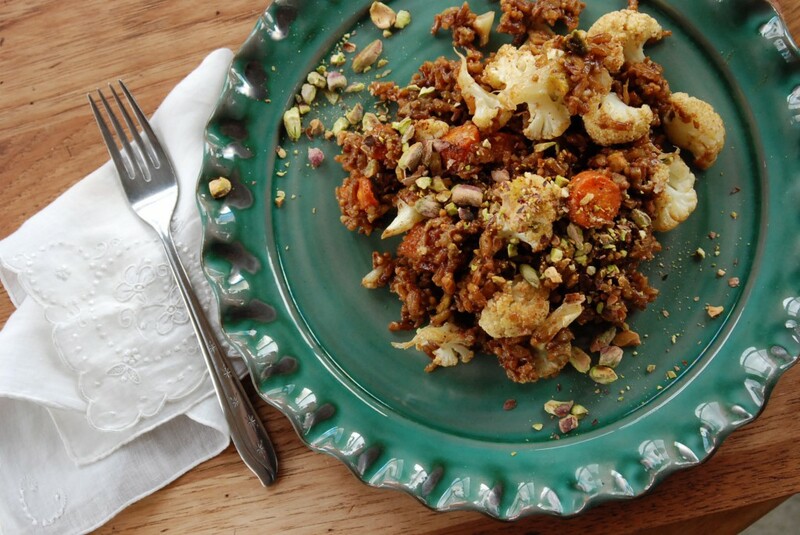 Instead of carrots and cauliflower, add whatever vegetables you have on hand, or swap almonds, walnuts, pecans or peanuts for the pistachios. This is your base, and when you read through it, your tastes will direct you, just as they should. Trust those instincts. And enjoy. In a 2-qt saucepan, heat oil briefly and add ginger, mustard seed and shallot. Cook for a few minutes, until the ginger is fragrant and the seeds are popping slightly, then add chili powder and turmeric. Stir it up well and cook for a few seconds until the smell is amazing. Add rice, water, brown sugar and salt, stir it up good to combine it all and bring to a boil. 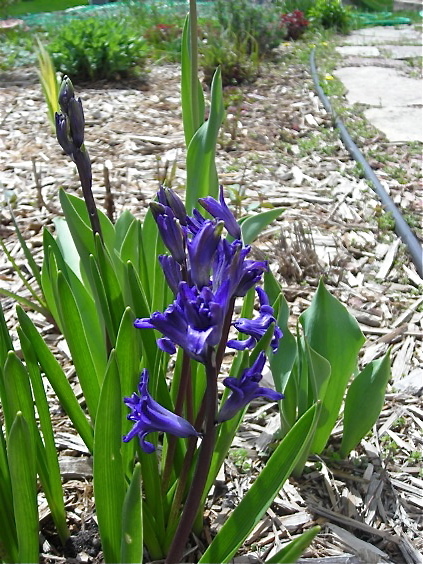 Cover tightly, reduce heat to low. The amount of time needed to cook the rice will depend on what rice you use. Test the grains after the time specified on the package, and adjust to your personal taste. Allow to cool slightly. 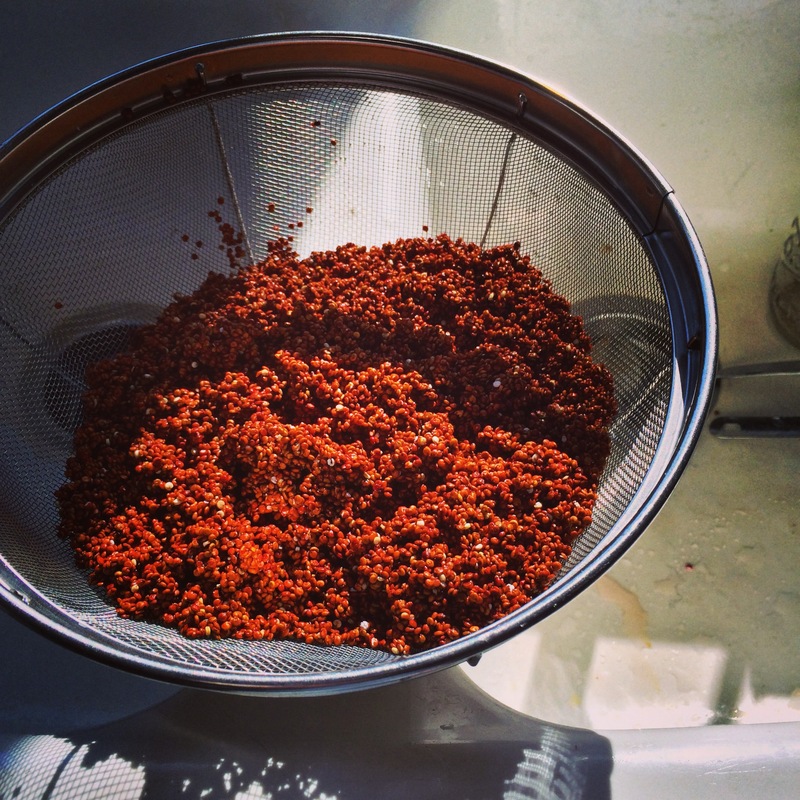 If you are using a true red rice, be patient with it. The time required for me to make mine was slightly over an hour. And every minute was well worth it. While the rice cooks, heat the oven to 400°, and toss the vegetables with a bit of oil and salt. 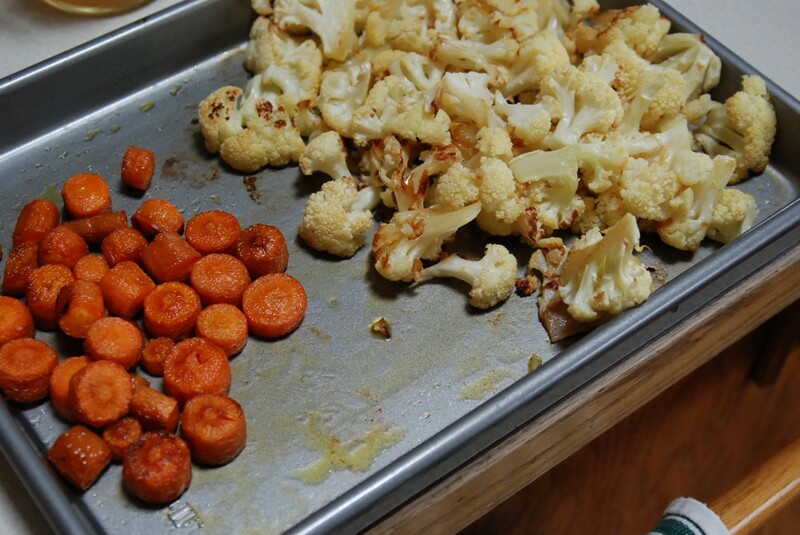 Since these two cook differently, I put the cauliflower on one pan, the carrots on another and roast until each are tender, shaking the pan often, and stirring to insure even browning. They can hang out in their finished state, until the rice is done. If you love a good deep flavor for pistachios, take a few minutes and toast them in a skillet over medium heat. It’s well worth it, and that rice gives you plenty of time. When the rice is done and cooled, dump it all in a large bowl and add the roasted vegetables. 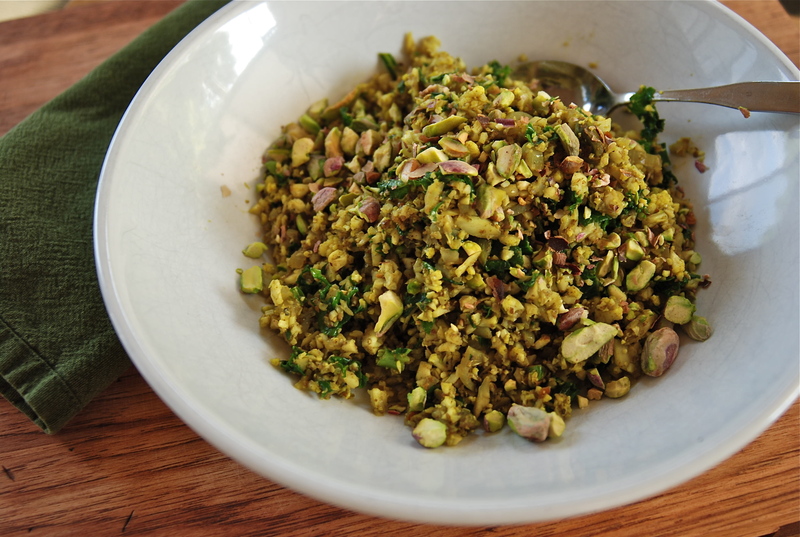 Toss together gently and add a few tablespoons of those nicely toasted pistachios. Toss a bit more, taste and add salt and pepper if you wish, then serve it, topped with more pistachios. This dish is good whether served cold, hot or at room temperature. You can garnish it with chopped scallions too, for a bit more flavor. If you follow me on Twitter, or hang out over on Facebook with me, you probably saw me post about him last week when he arrived in our household. We were just a little excited about him joining our family, and the past week has been full of new adventures, excitement for us and for him, sharing with us all the love he has within his superbly soft and furry little frame. 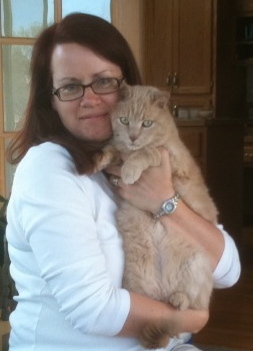 This cat is like the softest teddy bear I’ve known, and oh so very cuddly; he loves to be held and burrows himself into me when I lift him to my shoulder. 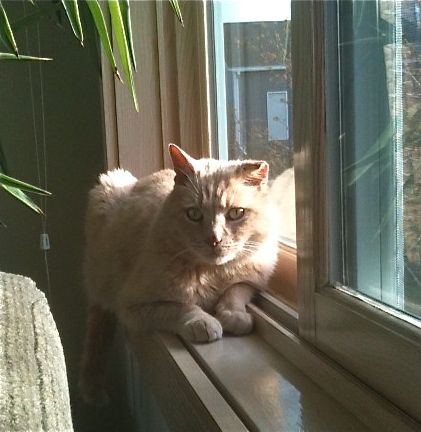 He’s affectionate, talkative, playful, and eager to learn everything he needs about his new home. 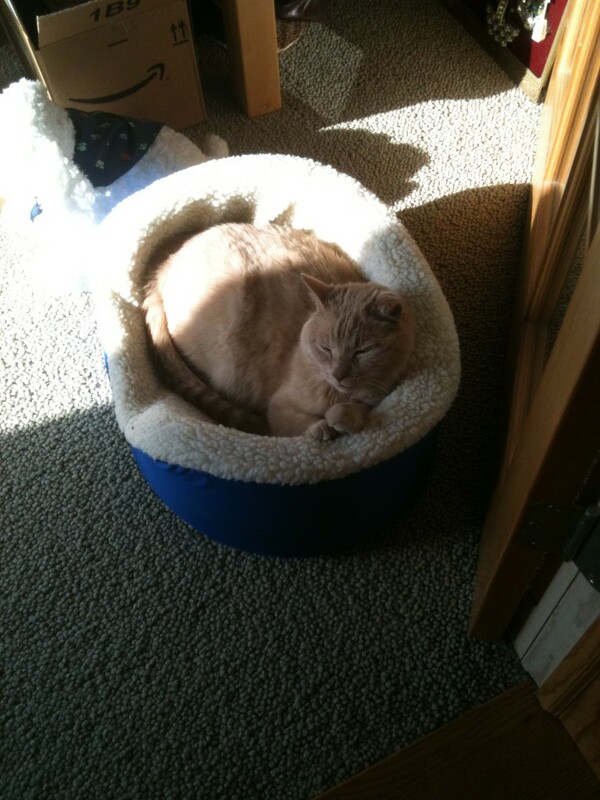 Like where Bustopher’s best snoozing spots are located, for one thing. 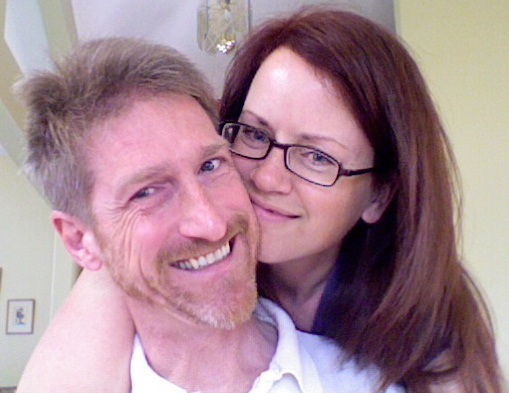 Eli is doing a wonderful job of healing the hole inside of all of us that was left with Harmon’s passing. 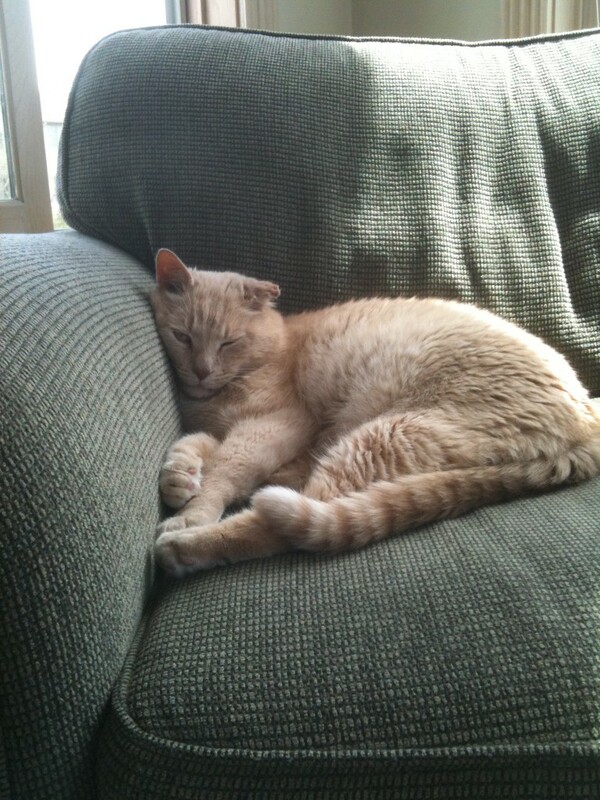 In the past few weeks Bustopher has needed a lot of attention, and seemed so unhappy when we left him alone. And we just felt empty. A new friend was necessary, and one visit to the shelter was all it took. Life has come full circle again. 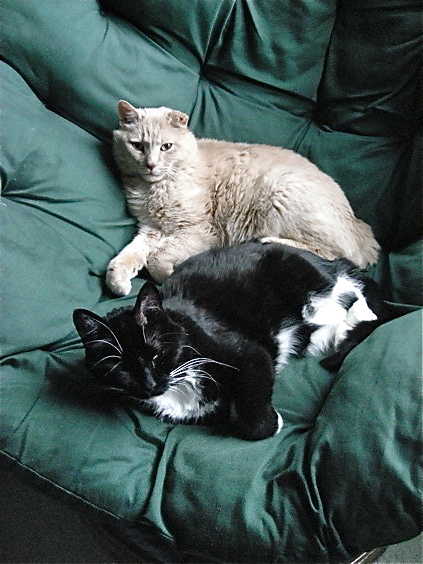 It’s a great testimony to what Harmon brought to my life, a love that went very deep and was so painful to lose, but was also powerful enough to make me believe I could withstand it again, that I could expand my heart to accept another feline friend. I’m already quite in love with him. He is a good match for all of us. 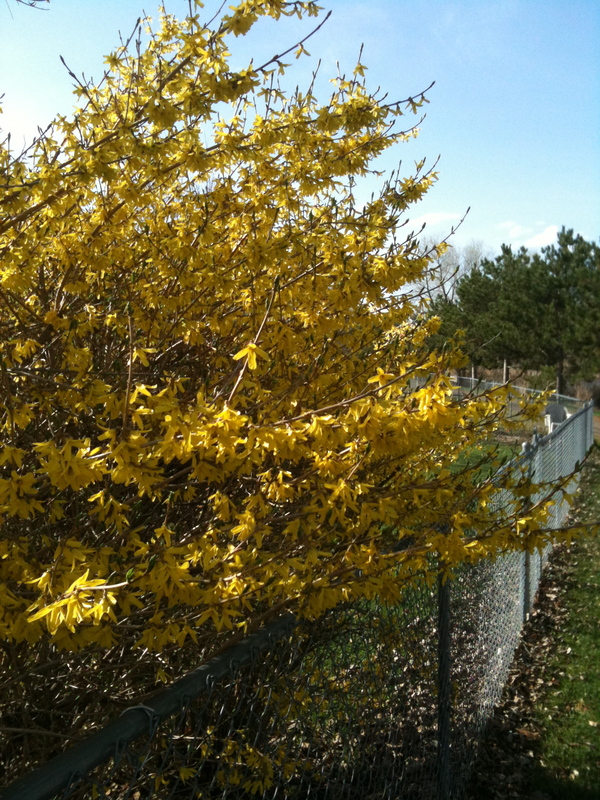 And then of course, the best part of everything happening right now is that Spring is just busting out all over it’s glorious fragrant self, shining in the sunlight for us all to behold and embrace. Along with falling in love with our new pet, I’m also just blissfully over the moon about pan roasted cauliflower. I know, strange isn’t it? With the verdant strands of spring asparagus, fresh pea shoots and the promise of ramps, I’m going slightly ga-ga over cauliflower, snatching up head after head of it and searing it to browned perfection in a pan while I bliss out in anticipation of the first bite to reach my lips. Griffin won’t touch it. He will eat it steamed but only steamed, turning away in scorn when he lifts the lid on yet another pan of golden roasted florets at dinnertime. I don’t argue. It leaves more for me. I made half a head of it for lunch one afternoon and sighed my way through each forkful until the entire bowl was empty. The process of cooking it in a hot skillet, over searing heat with just a touch of oil leaves the florets crisply tender and sweetly succulent. I certainly could do worse for falling in love with a vegetable; cauliflower is low in fat and high in fiber, folate and Vitamin C, as well as the wide range of phytochemicals present in other members of the Brassica family like kale, chard, broccoli and cabbage. And you know what? It’s so very simple. The key to making it nice and caramelized is to slice the pieces so the sides are flat. Place them in a bowl and add a little oil, some seasonings that you like as well as a bit of salt and pepper. Mix it up nicely while your pan heats on the stove. When the pan is smoking hot, empty the cauliflower in to it and spread it out. Let it sit for about 5 minutes undisturbed. Then toss it a little. Turn down the heat and cover the pan, with a lid or foil, then let it sit undisturbed for maybe 10 minutes. Toss it a bit more. Cover again, let it sit and repeat this until the cauliflower is as tender as you like. I like some bite to mine still. But it tastes just as good when it’s nice and soft. A sprinkling of good parmesan cheese tastes nice on it. You can add some thinly sliced garlic too, for extra flavor. Give it a try, won’t you? 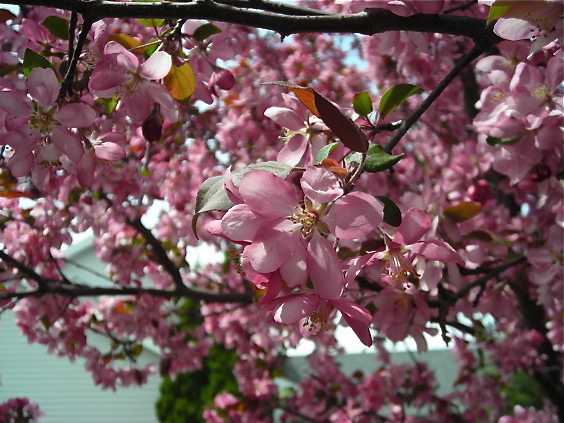 Maybe you’ll find more reason to fall in love this Spring too. That is of course, unless you already are.